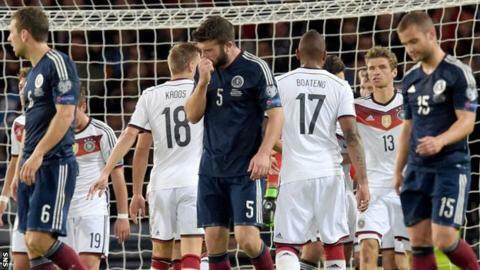 Scotland have dropped nine places to 40th in the latest world rankings following their Euro 2016 qualifying defeats by Georgia and Germany. Gordon Strachan's side are now behind Northern Ireland, who have moved up six places to 35th. Wales have moved up one place to a best-ever eighth, with England static, two places behind. Scotland remain three places above Group D opponents Poland, who have also dropped nine places. That is despite the Poles following their 3-1 defeat by Germany with an 8-1 hammering of Gibraltar. Group leaders Germany move up one place, leapfrogging Belgium into second place behind Argentina, who again top the list from world governing body Fifa. Republic of Ireland, who moved above Scotland into third place in Group D, have slipped three places to 54th despite their wins over Gibraltar and Georgia. Their win over the Scots helped Georgia move up 37 places to 110th, while bottom-placed Gibraltar are not listed. Scotland go into their final two European Championship qualifiers - against Poland and Gibraltar - looking for two victories to keep alive their hopes of making the finals. Norway are the biggest movers in the world's top 50, rising 35 places to 34th. Meanwhile, Cape Verde Islands have moved up 15 places to 41st - one spot behind the Scots.